Recycler Sims Metal Management expects underlying earnings (EBITDA) for the first half of 2012-13 to be in the range of $110 to $120 million. This is not encouraging as the full year 2011-12 earnings (EBITDA) were $253 million. Chairman Geoffrey Brunsdon told the annual general meeting that 2012 marked a number of low points for the company in its recent financial history. After a peak in the generation of scrap metal supply in 2008 in the US and the UK, the global financial crisis decimated consumer spending in the US and Europe. The generation of post consumer scrap, the companys most valuable source of feedstock, was adversely impacted and the weak scrap flows contracted margins across the industry. In response the company has reduced costs by $4 million per month and expects to reduce UK costs by about $1.5 million per month over the next three months. Despite this our profitability and our share price is not where we want it to be. This time last year our shares were trading at around $13. In July 2008, before the onset of the global financial crisis, they were above $43. The companys share buy back program, now ended, saw the cancellation of almost four million shares for a total outlay of just over $47 million and at an average cost of $11.92 each. Mr Brunsdon said 26 of Sims facilities were in the path of Hurricane Sandy and some had significant damage, but all of the facilities were operating within five days. Group Chief Executive Officer, Daniel Dienst, said Sims recently disposed of assets in North America that had below trajectory returns and did not meet its long term strategic objectives. There are some recent bright spots in the US economy - vehicle sales are up more than 7 per cent, housing starts are up and there have been 1.15 million household formations in the last year, there is a slight rebound in consumer confidence and a creeping up of hours worked. These are all historical data indicators of scrap generation to come, he said. In Australasia ferrous intake tonnes grew by 3 per cent through greenfield facilities and bolt on acquisitions that added 10 new collection sites. Strategically, the company will continue to expand in its core metals and electronics recycling markets and in emerging economies such as China, India and the Middle East. For example, in September its e recycling business, Sims Recycling Solutions, opened a collection facility in the United Arab Emirates, the first of its kind in the region. Qube shareholders have approved the companys change of name from Qube Logistics Holdings Limited to Qube Holdings Limited. The ASX code remains the same. The change is to differentiate the parent entity from the containerized logistics division which operates as Qube Logistics. Shares in Tox Free Solutions reached a 10 year high of $3.04 on 12 November. 678,250 options with an exercise price of $2.38 each have been converted to shares, including 366,000 by managing director Steve Gostlow. Mr Gostlow told the companys annual general meeting that 2011-12 was Toxfrees most successful year to date. Our business continues to expand in line with our vision of being Australias leading waste management and industrial services company. 3. Provide a full range of waste management and industrial services in regional areas primarily linked to the resource sector. Approximately 28 per cent of our business services the oil and gas sector, 20 per cent Government, 18 per cent mining, 13 per cent infrastructure, 12 per cent commercial and 9 per cent manufacturing. Current trading conditions are mixed, said Mr Gostlow. Our services to the oil and gas and mining sectors in Western Australia and Queensland continue to remain buoyant, with the major contracts performing well and growth evident in Pilbara, Kimberley, Surat and Bowen basins. In contrast we have seen challenging trading in the retail, manufacturing and infrastructure sectors particularly on the east coast. As a result, our industrial services business on the east coast has been slightly below expectations for this time of the year. Our government contracts mainly serviced by our hazardous waste services are also performing well. Shares in Energy Action reached a new all time high of $2.88 on 14 November. Evergreen Capital Partners has become a substantial shareholder with 5.3 per cent. Aspen Parks Property Fund is looking to acquire traditional tourist parks, particularly in the northern NSW and southern Qld region, said chief executive Lino Brolese in a video update for investors on the Funds web site. The Fund will also add cabins to parks with high occupancy levels. Identified parks are in Melbourne, Perth and Albury-Wodonga. Income and profit are both expected to rise by 4 to 6 per cent this financial year, and yield to be maintained at around 9 per cent. Shares in Transpacific Industries Group fell to a one year low of 66 cents on 15 November. On the same day Transpacific Industries Group provided an update on moves to simplify its debt structure. At 30 June it had $1,129 million of gross debt including $169 million of USPP Notes and $51.3 million of Convertible Notes outstanding. By 7 December it expects, through a combination of repurchases and redemptions, to have eliminated the outstanding Convertible Notes, and on 17 December $115 million of USPP 5 year Notes will be repaid. The redemptions and repayment will be funded from existing bank facilities reserved for this purpose. On completion of these transactions, TPIs debt facilities will comprise $1,429 million syndicated bank debt facility with a three year weighted average maturity and available headroom of about $200 million after allowance for bank guarantees on issue; and $54 million USPP Notes which will mature in December 2017. 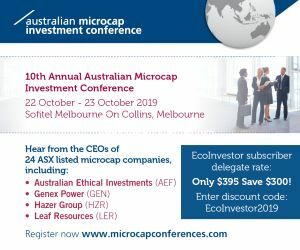 Carbon Conscious received an ASX query about the rise of its share price from 5.8 cents to 11 cents in about a week and on an increase in volume. But Carbon Conscious said it had no explanation. Clean TeQ Holdings has signed two non binding Letters of Intent (LOI) with Ishihara Sangyo Kaisha Ltd (ISK) for the use of Clean TeQs Clean iX technology to recover scandium and other valuable metals in the acidic process streams of titanium dioxide producers. ISK is a leading Japanese producer of inorganic and organic materials and has titanium dioxide production plants in Japan and Singapore and also manufactures other functional materials. The first LOI is between Clean TeQ, ISK and Clean World Japan Ltd, the joint venture in Japan between Clean TeQ and Nippon Gas Co Ltd. It covers the recovery of scandium and other valuable metals from ISK owned plants globally and other titanium dioxide plants in Japan. The second LOI is between Clean TeQ and ISK and covers potential opportunities for scandium recovery from all other titanium dioxide producers. These projects are longer term but have the potential to extend the use of the technology worldwide, said Clean TeQ. Appraisal of the Clean iX technology has been going for six months and will continue over the next six months. Completion of the process design and appraisal will see contracts signed and the first recovery and purification plant constructed at ISKs Yokkaichi Plant in Japan. This milestone will trigger the license fee payment from Clean World Japan Ltd to Clean TeQ of $3.5 million as announced last month. Chief executive, Peter Voigt said The relationship with ISK has been developing for the last six months and the signing of these LOIs is a significant step in the commercialization of our Clean iX technology in the resource recovery marketplace. Energy Developments and Enerji have extended by a year their October memorandum of understanding outlining the process for potentially designing and installing Enerji waste heat to power systems at EDL sites. Long time Ceramic Fuel Cells chief executive, Brendan Dow has stepped down as part of the recent changes at the company as it focuses its operations to its main market in Europe. The new CEO is Bob Kennett, who has been a non executive director since 2006. An engineer, Mr Kennett has served as chairman and director of Powergen Renewables Ltd, and a board member of the Combined Heat and Power Association and chairman of the CHPA Micro Forum. Chairman Alasdair Locke thanked Mr Dow for his many years of hard work at the company and wished him well in his endeavours. Australian Renewable Fuels (ARFuels) and Wentworth Holdings Ltd have agreed to merge in a deal that will deliver ARFuels $14 million in cash. The proposal is unanimously recommended by the directors of Wentworth and will be implemented through an off market takeover. ARFuels will make a scrip offer of 5.7 of its shares for each Wentworth share. ARFuels anticipates pre bid acceptances with certain shareholders and all Wentworth directors for 19 per cent of Wentworths shares. A condition of the offer is a minimum of 90 per cent acceptance. The merger will provide ARFuels with a cash injection of $14 million to fund working capital, future growth and strengthen its balance sheet. The net tangible asset backing per ARFuels share is expected to increase from 0.4 cents to 0.65 cents. The estimated reduction in ARFuels net gearing is from 65 per cent to 13 per cent. The boards of both companies said there is a compelling strategic rationale for the transaction as it will combine the technical expertise and production capability of ARFuels, Australias only national biodiesel producer, with Wentworths economic resources. Vaughan Webber, chairman of Wentworth, will join the ARFuels board as a non executive director on completion of the merger. Clean Seas Tuna said the health and survival rates of its kingfish continue to improve. Chief executive Craig Foster said the turnaround follows the addition of synthetic taurine (an essential amino acid) to the manufactured feed diets provided by the companys two major suppliers. Investigations revealed that the taurine content in feed supplied by the two suppliers had been insufficient and that the taurine deficiency in the kingfish diet was the principal cause of the suppressed growth and much higher than budgeted mortalities. The feed supply agreements with the suppliers prescribe a process for addressing feed quality issues, and Clean Seas Tuna has issued formal dispute notices to both suppliers. Based on investigations to date, independent legal advice from senior counsel and assessments of kingfish feed protocols in Japan, the Board has determined to invoke formal dispute resolution procedures with both feed suppliers to attempt to find a commercial compromise of the claims the company considers it has against both suppliers, he said. The potential difficulties of commercializing promising technology has been highlighted by Intec chairman Trevor Jones, who told the companys annual general meeting that In the 11 years since listing on the ASX, the company, despite the application of considerable time, energy and resources, has regrettably been unable to establish a self funding business based on the commercialization of the Intec Process, across any of the applications considered. Fortunately, the disposal of the companys legacy stockpiles of electric arc furnace dust (EAF dust) has given Intec $4.4 million in cash backed security bonds. Consequently, the company is currently in a secure financial position relative to its operating costs, he said. The focus this financial year will remain on the investigation of corporate and asset acquisition opportunities; preserving the companys financial position as far as possible without resort to shareholders; and investigating alternative value strategies for parts of its technology portfolio including the Burnie Research Facility. It will also continue the IRC Project for reprocessing an Iranian based zinc lead waste stockpile. This is subject to on going Federal Government approvals and the receipt of pre payments from the client. RedFlow has commissioned its new M90 battery installation at the University of Queensland, saying the M90 is a significant step forward in its plans to commercialize its proprietary zinc bromine battery technology. The product comprises 24 zinc bromine batteries housed in a 20 foot shipping container and connected to a large scale solar PV array at the University of Queenslands campus in Brisbane. The system has a 90 kilowatt power output, with 240 kilowatt hours of capacity. By integrating large scale energy storage with intermittent renewable energy technologies, the M90 demonstrates the viability of energy storage as an important enabling technology for wide spread renewable energy deployment, said RedFlow. Dreyfus, Parliamentary Secretary for Climate Change and Energy Efficiency, Industry and Innovation, who launched the product. Vmoto is now listed on AIM. As part of the listing, the green scooter maker raised £1.6 million through a placing by finnCap of 121 million shares with institutional and other shareholders at 1.3 pence per share. Following the placement, Vmoto has 896,087,712 shares on issue and its market capitalization at the placement price is £11.6 million. finnCap is also acting as the companys nominated adviser and broker. Galaxy Resources production of lithium carbonate at its Jiangsu plant in China was 428 tonnes in October an increase of 50 per cent on September and in line with the plants ramp up schedule. Production was 154 tonnes of superior battery grade product with 99.5 per cent or above purity, and the balance was technical grade product. Sales on October of lithium carbonate totaled 273 tonnes with revenue of $1.7 million. Galaxy also recorded initial sales of battery grade product following customer testing. Sales will comprise mostly technical grade product until the battery grade product completes customer qualification testing. Battery grade samples have been sent to over 50 potential battery cathode customers in China plus a number of Japanese customers. AnaeCo has hosted senior officials from the Beijing State owned Assets Management Company Limited (BSAM) and Dynagreen at its DiCOM System facility in Perth. The guests were reviewing opportunities for the DiCOM System in China. AnaeCo and Dynagreen signed a Memorandum of understanding in May to form a collaborative relationship for the commercial exploitation of the technology in China and overseas. Carnegie Wave Energy hosted the leadership of the United States Defence Force and Australian Defence Force at its Wave Energy Research Facility for a briefing on the Perth Wave Energy Project at HMAS Stirling, Australias largest naval base. Attendees included General Martin Dempsey, chairman of the Joint Chiefs of Staff; Admiral Samuel Locklear, Commander, United States Pacific Command; Ambassador Jeffrey Bleich, American Ambassador to Australia; General David Hurley, Chief of the Australian Defence Force; and Dennis Richardson, Australian Secretary of Defence. Carnegie also presented scoping study results highlighting the suitability of its technology for both power and freshwater supply to defence installations globally. Enerji has issued 60,965,125 shares and 30,482,563 listed options. The shares were issued at 0.8 cents each and raised $487,721. The options have an exercise price of 3 cents. The companies said progress to date with a number of projects is being assessed. Geodynamics has successfully completed the first open flow test for Habanero 4, which has shown the best results yet for the geothermal energy developer. The test achieved the planned maximum production rate of 35kg/s at a flowing pressure of 29 MPa (4,200 psi) through a variable choke. The company said the surface pressures indicate the well has additional capacity to flow at higher rates which were not attempted during this test. Temperature at 4,130 metres depth was 241°C with a surface temperature of 191°C, and increasing, after 82 minutes of flow. Managing director and chief executive officer Geoff Ward said, This is the highest productivity result achieved at the Habanero location and confirms our view of the quality of the Habanero 4 well. The next steps are local stimulation followed by a second open flow trial. Following the completion of the second open flow test, the planned major stimulation exercise will be commenced and is anticipated to be completed in early December. Water Resources Group has reached agreement in principle and is finalizing an agreement with a US Corporation that may acquire a controlling interest in WRG's water treatment technologies through an initial US$25 million in new capital. Under the proposal, the US Corporation would own the water treatment technologies and current business operations. It would operate separately from WRG and be responsible for all future costs for technology development and marketing. WRG would maintain a substantial minority interest in the US Corporation. It would retain control of business exclusively in SE Asia, China and Australasia and receive a cash payment of several million dollars. Equity in WRG would not be affected, said chief executive, Brian Harcourt. On completion, all future funding requirements would be met by the US Corporation, enabling the Group to appoint new executive management in the US and provide a faster product roll out, he said. The proposed new agreement would require shareholder approval.